Commercial dog foods available today are available in three different forms; dry, semi moist & canned. Each of them varies by the contents, water level and shelf life. Home made cooked foods on the other hand may have superior freshness and quality ingredients and might be a viable alternative approach, assuming the foods selected follow a nutrition plan outlined by a veterinarian. Skin being the largest exposed part of the body, is sensitive to dietary imbalances..
Usually non seasonal allergies in dogs are suspected to be food allergies. Dogs diagnosed for allergic skin reactions and other signs of food allergy, should be fed what is called an elimination diet where the ingredients are pared back to single novel proteins and single novel carbohydrates, which also contain no additives or artificial ingredients. Meals provided should be smaller in size and supplied several times per day. The use of simpler carbohydrates and proteins is important since more complicated fiber and starches can trigger skin hypersensitivity due to digestive enzymes. This food initially is given as a trial for at least 2 months. 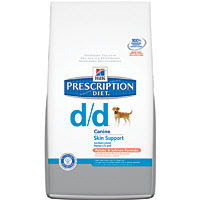 Commercially, many sensitive skin dog food products such as Hill's Prescription diet d/d are available for an "elimination" diet such as foods which contain venison, fish, and duck for the single novel protein (fish is preferred due to its' Omega-3 content) and potatoes for single novel carbohydrates. Home made foods using the aforementioned proteins & carbohydrates are effective in treating dogs with sensitized skin due to allergies if the ingredients are provided in the proper ratio and quality ingredients are used. Home cooked foods are preferable, however, maintaining the right balances of ingredients is near impossible at home, unless done under the supervision of a veterinarian. Usually only home made foods are prescribed in various food borne allergies because commercial dog foods contain artificial additives which are potentially the cause of the canine allergy skin reaction. Foods containing beef, mutton, pork egg and dairy products should not be administered as a source of protein. Similarly corn, barley, wheat & rice should be prohibited as source for carbohydrates, when food products are prepared for dogs with sensitive skin. Food therapy is usually less effective if a dog is also suffering from flea bite hypersensitivity. Dogs with sensitive skin may develop alopecia or hair loss. Such dogs require not only a confirmatory diagnosis for this purpose and also a slight adjustment in nutrition. Dogs having alopecia not due to seborrhea or oily secretions should be fed with an increased level of omega – 3 fatty acids along with mineral supplements especially those containing zinc & magnesium, for at least a 3 months time period along with a balanced diet. A dogs skin contains an outer layer that usually protects the dog from itch. However, an allergic reaction causes the protective barrier to slightly weaken, allowing for increased exposure of the nerve endings allowing them to become inflamed or itchy. In addition to sensitive skin dog food, a natural homeopathic remedy such as PetAlive Allergy Itch Ease contains ingredients such as Arum triph (seasonal and redness allergy relief),Viola tri. (itch) and Chamomilla (scratch and itch) that could be of help for dogs that respond to these types of remedies. Usually it is recommended that sensitive skin dog food selections contain simple protein and carbohydrates such as a fish only diet (Ocean Fish) for proteins, potatoes as source of carbohydrates (such as Hill's d/d® Potato & Salmon Formula Canine), fish oil in place of fats (Contains Omega – 3 fatty acids) and should not contain any additives, artificial colors and tastes. Zinc therapy should be an additional option for those dogs with alopecia.